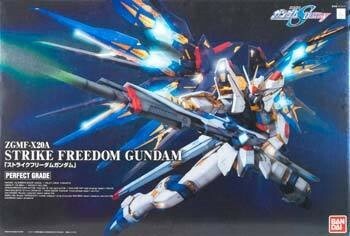 - Designed by master artist Hajime Katoki, this is the ultimate version of the Strike Freedom Gundam! 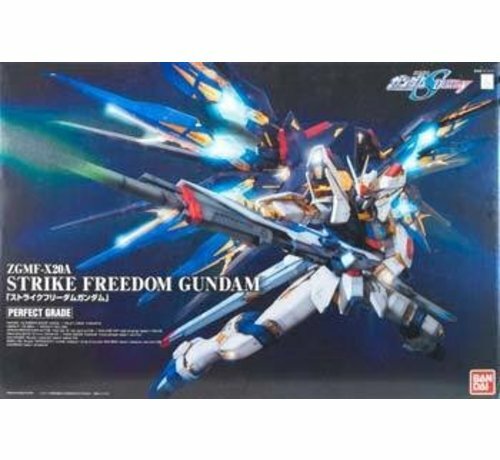 - The largest PG kit so far, the Strike Freedom’s massive wings expand to activate HiMAT Mode, giving the suit a silhouette that dwarfs all other previous PG kits! - Custom Display Stand included! Display Stand gives you the freedom to display your model in whatever dynamic poses you choose! - Extra Finish Inner Frame! Inner Frame pieces moulded with Extra Finish, giving it a golden shine and drawing attention to it during HiMAT and Full Burst Mode! By sliding out the Super DRAGOON weapons, each part linked to it is expanded into firing mode. - Redesigned Mobile Inner Frame! Golden Inner Frame is exposed when manipulating the joints. 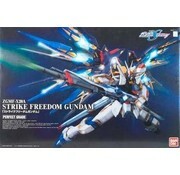 Exterior armor is designed with a sliding gimmick which, in conjunction with an inner frame evolved from the PG Strike Gundam, gives this kit a dynamic frame effect. - New, stronger joint mechanism! Weight Bearing parts such as the hips and legs have been redesigned with a new mechanism. with this updated joint system, you’ll have no problem creating whatever poses come to mind! *Requires 2x LR41 batteries for LED, batteries sold separately.